The trees are trimmed, the halls are decked: on Friday night, we open Blossoms of Light™, and we couldn’t be more excited about this year’s display. With new features and more lights than ever before, we think even the most seasoned holiday visitor will walk away in amazement. As the event gains more and more popularity, we want to share some tips and tricks for getting the most out of your Blossoms of Light experience. Buy Your Tickets in Advance – For Real! Tickets went on sale on October 1, and we’ve already sold quite a few! While this may have once been an event you could make a last decision about, it’s no longer that kind of event. Tickets are limited each night and are spread across four timed entry windows and we expect to sell out most nights. Plus, tickets increase in price by $5 at the door, so you really can’t go wrong by booking in advance. Last year, we sold out every single night of Blossoms of Light during the last two weeks of December, and we sold out almost every weekend night during the entire run. The slowest nights to attend are weeknights during the week after Thanksgiving and the first week of December. Want Great Photography? Come Late! If you want pictures that feature the lights and not hundreds of strangers, buy tickets for the 8 p.m. time slot on your chosen date. The crowds definitely thin out after 8:30, and though entry stops at 9 p.m., visitors can remain in the Gardens until 9:30 p.m.
Want Really Great Photography? Brave the Snow! Yes, it will be cold. But Blossoms of Light really comes to life under a blanket of fresh snow! Don’t let a little Colorado weather scare you away… your Instagram followers will thank you! We’ve partnered with Lyft to help encourage our visitors to skip the hassle of city parking and arrive in style right at our front gate. New users can save $5 off their first three rides with code GARDENS18, and new or existing users can save 20% off one ride to or from the Gardens with code BOL2018. And don’t forget: the event is easily accessible by two RTD bus lines, has several Car2Go spots and has a B-Cycle station just outside the main entrance. 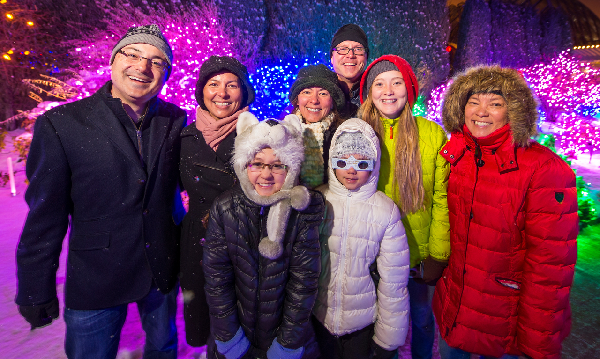 This year, all food locations will be open until 9 p.m. every night of Blossoms of Light (including Christmas). Stop by the hot beverage bar, Offshoots Café, the roasted nut tent or The Hive garden bistro for treats, beverages or dinner. Kill two birds with one stone and knock out some holiday shopping as you exit Blossoms of Light; The Shop at the Gardens will be open until 9 p.m. each night. Or, stop at our ticket counter in the Bonfils-Stanton Visitor Center to give the gift of a Gardens membership. Blossoms of Light is open 5-9 p.m. every night from November 23 - January 1. Advance purchases are highly recommended to get the best price and to ensure admittance on your desired date. Get your tickets today!